in the local computer network. Useful display tools, distance measurement tool, settings management tools. Advanced data management options: internal database, real-time NMEA data output, customizable data export. 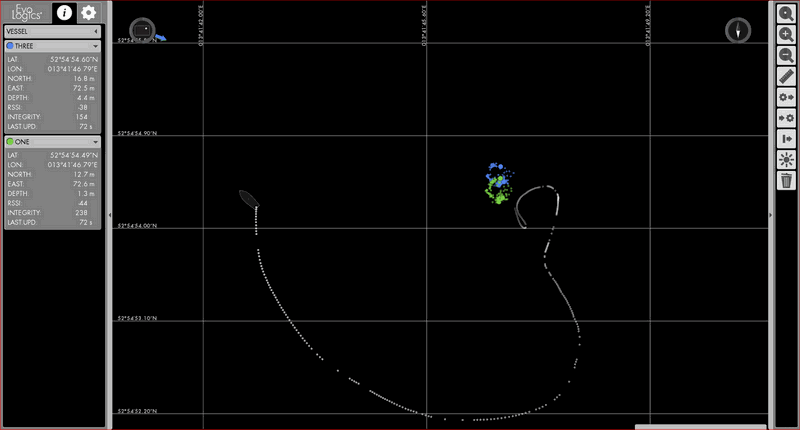 A tpical EvoLogics USBL (ultrashort baseline) positioning system controlled by SiNAPS is pictured below. A USBL transceiver is mounted on a Vessel and uses acoustic signals to determine the distances and bearings to the tracking targets. The USBL transceiver measures the time from transmission of its acoustic interrogation signal until an acoustic reply from the Transponder is detected and converts it to distance to the Transponder. Containing several transducers separated by a short distance (the ultra-short baseline antenna), the transceiver calculates the angle to the Transponder using the phase-differencing method. Transponders are attached to several tracking targets, for example, to autonomous underwater vehicles (AUVs), remotely operated vehicles (ROVs), towfish etc. The Transponders reply to acoustic signals from the USBL transceiver with their own acoustic pulses, allowing it to calculate their positions. Optional third-party external instruments (an AHRS sensor and/or a GPS receiver) provide information about the vessel's orientation and real-world coordinates. The customer's Navigation computer is interfaced with the USBL transceiver and the external instruments and is connected to the local computer network. 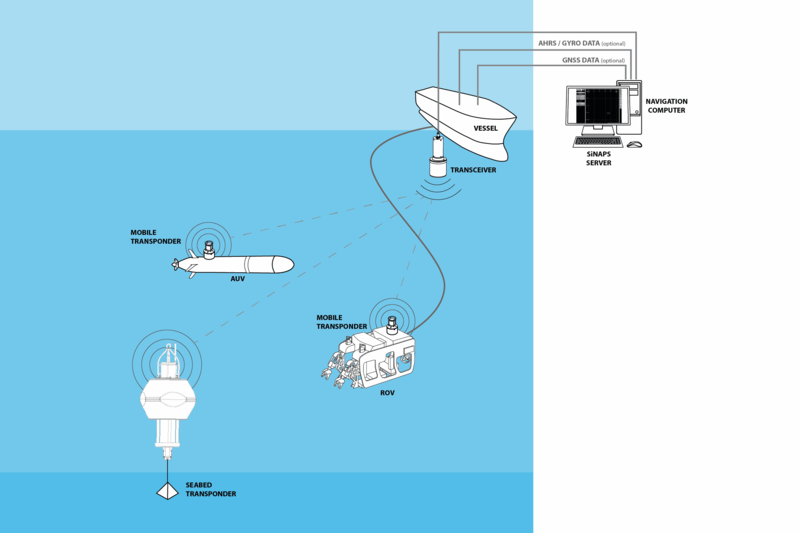 The SiNAPS server is a software component, installed on the Navigation computer interfaced with the USBL transceiver and other external instruments. The SiNAPS server receives, processes and stores data from the USBL transceiver and external instruments. It performs all the necessary calculations to display this information on-screen. 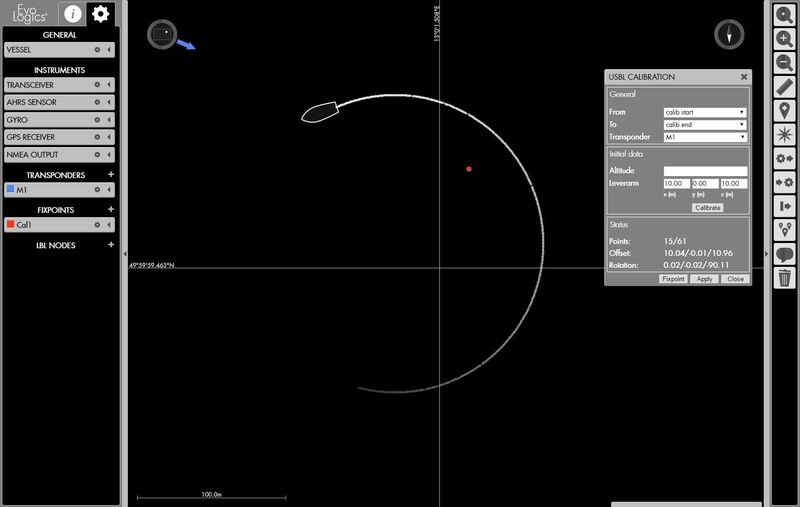 The SiNAPS client is the web-based user interface of the positioning system. It displays real-time information about the positions of the Vessel and the targets, provides access to data management tools and system configuration settings. The user interface can be opened in most current web-browsers on any device in the local computer network. It is possible to open SiNAPS clients on multiple devices at once. To access SiNAPS UI, one must simply navigate the web-browser to the correct address.